Router table for my table saw. Ive never had the need for a router table until today, I’ve always routed by hand. I took a couple hours and some scraps I had laying around, not wanting to spend any money on it. Initially I wanted to throw something together for a single project I had. It turned out a little better than I thought it would for a first time build and designing on the fly. I think I’ll keep it on the right side of my table saw from now on. If nothing else it will add a little more table space to work on the saw. Love this! I made one for my Ridgid R4512 (they even give you the dimensions for the add-on table area). However, I like how you integrated dust collection into yours. I was always wondering the best way I could do that on mine. You just gave me a great idea to add on. Thanks! The underside of the fence isin’t pretty but it’s pretty effective for removing waste material. 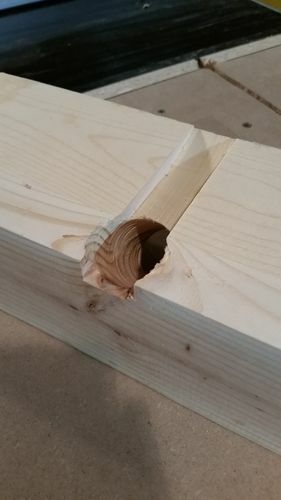 Cut a dado with the table saw and didn’t cut it all the way through so that material couldn’t make it outside the back of the fence. Ive only cut rabbits on it so far but it must collect 95%+ of dust and chips on rabbits. ugly as hell but pretty effective.